AM Camera is owned and operated by Andree Martin. 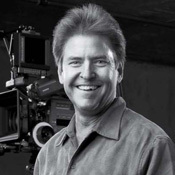 Andree started his motion picture career in 1977 as a photographic technician in the U.S. Air Force. The first film camera he laid hands on was an Arriflex 16s. Upon his honorable discharge in 1981, Andree contacted a close family friend. Albert Mayer of Panavision. Albert put him in contact with Wolfgang Reigl at Arriflex in Burbank, CA. and the love affair with the motion picture camera began. For three years Andree worked under the incredible mentorship and tutelage of Wolgang Reigl and rose to the position of Assistant Service Manager. 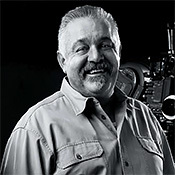 Wolfgang is regarded as one of the all time finest camera technicians / engineers in the history of the motion picture industry. The summer of 1984 brought Andree to his challenging and rewarding 33 year stint with Clairmont Camera. Managing one of the largest camera inventories in the world, he and his staff performed repairs and modifications thought impossible outside of the manufacturer’s facility. Andree rose to the position of Vice President and on many occasions provided technical analysis to Arriflex for the 435 and Arricams. Moviecam for the Compacts and SL’s and Aaton. A sample of accomplishments include modifying 35BL’s and Arri-3’s to Super 35, the first 3-perf modification of the 35BL. Design, manufacture and installation of 2 perf into the 35BL and 435. Design and installation of lens mount and carry handle modifications in the Sony F-900 and Panasonic HD cam. Studio accessory design for the Panasonic Varicam and the Alexa In-camera Filter System. AM Camera came about in late 1984 when Denny Clairmont introduced him to a camera owner with an impact damaged Arri-3. As the years went by, AM Camera grew into a second job and cameras came rolling in from all over the United States, Canada, Mexico, China, Italy and Brazil, all by word of mouth. As the saying goes, the only constant is change, the era of Clairmont Camera has sadly come to end. But the end is also the start of new beginning. In the fall of 2017, Andree opens AM Camera on a full time basis. Mike started his career in the motion picture industry in 1980 upon his honorable discharge from the U.S. Air Force. He worked for 2 years as an apprentice machinist for a company that provided service and modifications on motion picture cameras. He then went on to a rental house in Hollywood and worked as a Technician for 16 years. During that time he was allowed to freelance on productions as well, where he worked as a 1st Assistant Cameraman before moving up to Camera Operator. In 2000 Mike decided to move on to Clairmont Camera where he was hired to manage Clairmont’s Electronics Department full time. In 2002, during the birth of High Definition, Denny and Terry Clairmont asked Mike to start Clairmont’s HD Dept. He made most decisions regarding equipment purchases and other needed equipment and helped develop business decisions that were needed to get Clairmont Camera a strong foothold in the HD world. Working alongside Andree Martin, the two developed and engineered modifications to cameras and accessories only available to Clairmont customers. Mike retired in April, 2017 as V.P of Clairmont’s very large Digital Division after 17 years of service. It was midyear of 2018 that Andree approached Mike to work with him and handle all of AM Camera’s electronic service needs. He happily accepted the offer. Mike is also an active member of the S.O.C. and an associate member of the A.S.C.